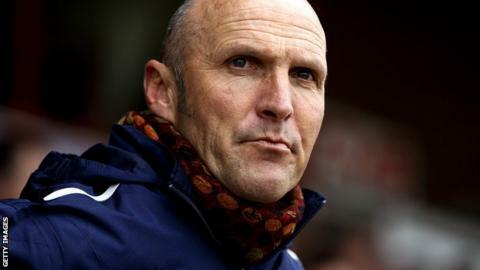 Chester manager Steve Burr says his team have to take responsibility after Saturday's 5-0 loss at home to Barnet. Chester, who were reduced to 10 men, conceded three goals in the first half and missed a penalty. "In all my time in football, that 45 minutes was hard to take," Burr told BBC Radio Merseyside. Chester finished in the bottom four last season, only remaining in the Conference after Hereford United were expelled for financial reasons. But they made the worst possible start to their second campaign back in English non-league football's top flight. "Everything that could go wrong in the first 45 minutes in a football match did go wrong for us," said 54-year-old Burr. "Even with 10 men we had chances to score in the first half. We felt we could have done a lot better." Chester now face Forest Green, one of the pre-season favourites for promotion, on Tuesday night and Burr says the squad are determined to turn things around. "No-one in the dressing room has been involved in 45 minutes like that," he added. "It won't be difficult to lift them because they are all disappointed at how things have gone."